I do hope you are all well? Now the second I saw this wool, I had to have it. The colours were gorgeous and the texture and squishiness of the natural wool was to die for. The colour was the main temptation for me, but the thought of that luxurious yarn running through my fingers as I hooked it into something, were too much to resist. The yarn is Peer Gynt, from a Norwegian company Sandnes Garn. 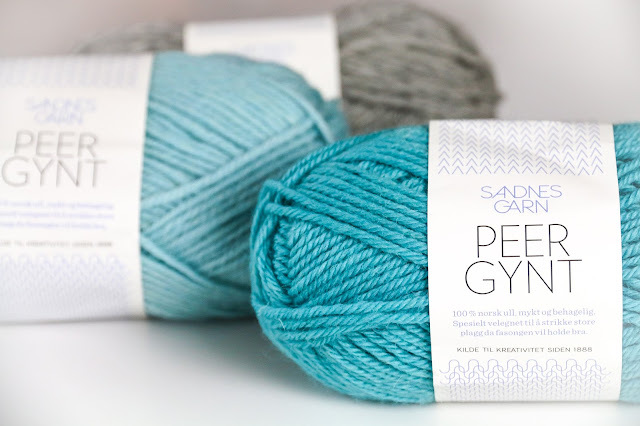 It's some gorgeous yarn, a superwash wool and comes in some AMAZING shades!!! So I bought the yarn, not really knowing what I was going to make. After some thought, I went home and got working on a baby blanket. I thought that the bright turquoise would be a great choice for a baby, it was fun and bold. I also thought that the lighter turquoise and the grey would add some nice accents to the blanket, breaking up the colour a little. I got to work on the blanket, making up the pattern as I went along. I used a stitch that I had used on a previous baby blanket (tiramisu baby blanket) which consisted of working 2sc in a stitch, skip the next stitch and repeat. I liked this sc stitch pattern, it was simple but added a variation to the look of just doing rows and rows of plain single crochet's. Once I had worked a block using this single crochet pattern, I added some regular single crochet rows, using my other colours. This added a nice contrast to both the stitch pattern and the colour of the blanket. I was very pleased with how bright and striking the blanket was looking. I felt that it was looking pretty modern. The simple colour blocks, along with combinations of the bright colours next to the contrasting cooler grey, seems to be quite popular at the moment. Once I was done with my contrasting "stripey bit", I continued to crochet with the main colour until I felt that the blanket was large enough. It took me a little while as the single crochets were slow work, but they were very pretty and perfect for a baby blanket. Once I was satisfied with the size of the blanket. I added some rounds of sc using a combination of the colours to make the framing border. As I was working the border section I noticed that my work was starting to warp! The warping was coming from the amount of sc's I was performing into the side of the blanket, it was maybe a few to many, which meant that my work wasn't lying flat. I debated about redoing the border? Dennis ensured me that it would probably be fixed with a good blocking, once the blanket was complete. I persevered with the blanket finishing the border with a nice classic round of shells. I wish I had a picture of how the blanket was looking before I blocked it. It wasn't a pretty sight! It was so insanely wrinkly, I really didnt think blocking was going to be able to sort this out. I gave the blocking a go though. Simply soaking the blanket in warm water and pinning it out on one of our sofa cushions. I then left it to dry for a day or two, to make sure that it had really set in the shape that I wanted. The corners are not completely square, again probably due to a few too many stitches in the row. The blanket is lying flat though, and that was really the main thing for me. I'm really very pleased with how the blanket turned out, especially as there were moments when I thought that the end result were going to be a complete mess. 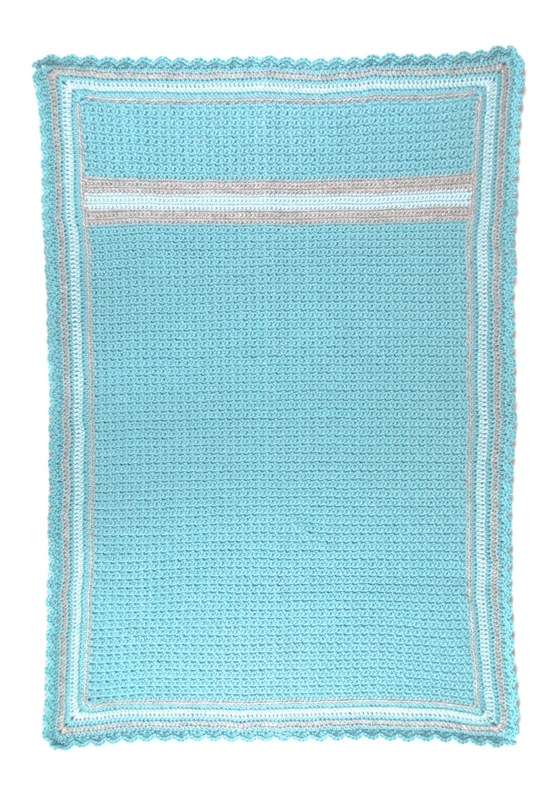 I love how the colours look quite modern, yet the shell edging (especially) adds a very classic feel to the blanket. I need to do a little tweaking of why the pattern didn't quite work up to plan. Once I've done that, I'll be sure to share my making method with you all, so you can give making this blanket a go if you fancy?! The blanket is precious! I look forward to your finished pattern. 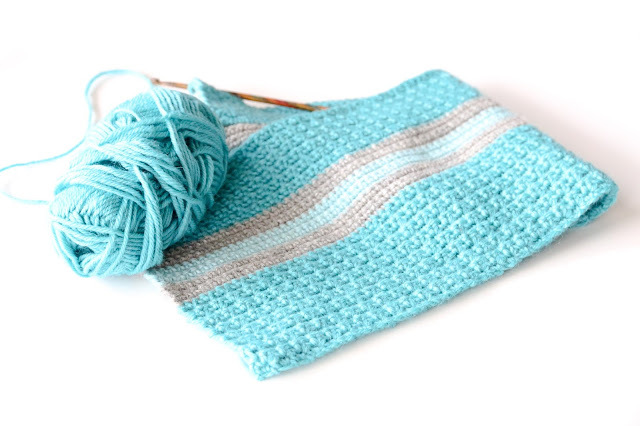 Ooh Love your blanket - love the colour and the yarn looks beautiful! Have had laptop problems so have been catching up and was excited to watch another vlog - love our time in bed together! Have been crocheting a cat blanket, a mouse and a hedgehog, I love small projects at the moment, I blame Pinterest - keeps giving me ideas! Love it! and the colors are fantastic! I just found your blog today and so happy!